The Absolute Beginners Guide to Making Metal Clay Jewelry is absolutely the best book you can invest in if you want to try teaching yourself to work with this amazing material. Cindy Thomas Pankopf has put together a brilliant guide for Kalmbach Books. Why do we need another beginner's book? Because the varieties and formulations of clay have expanded so much, older books may not cover the type that will most interest you. 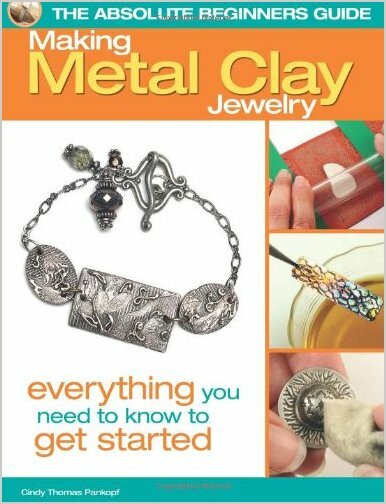 Since this is a beginner's book, Cindy chooses to do the projects with clay varieties that can be sintered fully by a hand-held torch rather than requiring a much more expensive kiln. She fully demonstrates all different techniques for working, firing, and finishing metal clay pieces but she does not cover kiln firing. The projects section of the book begins with pretty pendants, charms, and earrings that allow you to practice many basic techniques and perfect them before moving on to more complicated pieces. From there, Cindy guides you through stone-setting, using syringe clay, forming pieces around supports, and a number of special techniques including molds and added patinas. Even the topics of repairing broken pieces and reclaiming left over dried clay are covered. One of my favorite projects, found on page 98, is called a Paper Overlay Pendant. It uses a paper-type form of clay. You can cut this clay with scissors and use the pieces as overlays and decorations for a wonderfully detailed final piece. I have been reading your blog for a couple of months now. I just want to say thank you for all the wonderful information that you blog about. I found you on Art Bead Scene & I'm very glad that I did.